Product Title10K Solid White Gold 0.10 cttw Diamond Pave Disc Bracelet 6"
Product TitleVS/G 1ct Diamond Classic Tennis Bracelet U Prong White Gold 7"
Product Title3ct Treated Black Diamond Tennis Bracelet 14K White Gold 7"
Product Title2ct Diamond Tennis Bracelet 14K White Gold 7"
Product TitleDiamond Accent Heart Charm Bracelet in 18k Gold over Sterling Silver 7.25"
Product Title4ct Diamond Tennis Bracelet 14K White Gold 7"
Product Title14K Yellow Gold 2 ct Diamond Tennis Bracelet 7"
Product Title3ct Black Diamond Tennis Bracelet 14K Black Gold 7"
Product Title3ct. 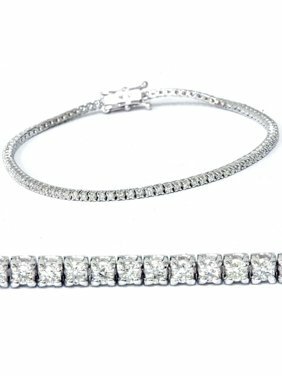 Round Cut Diamond Tennis Bracelet In 14k White Gold 7"
Product Title10K Yellow Gold Hollow Diamond Cut Miami Cuban Bracelet 9MM 8-9 Inches-9 in. Product TitleDiamond Accent Oval-Link Heart Charm Bracelet Platinum-Plated 7 1/4"
Product Title10K Yellow Gold 12mm Shiny High Dome Flex Bangle Diamond Pattern 8"
Product Title10K Yellow Gold 12mm Shiny High Dome Flex Bangle Diamond Pattern 7"